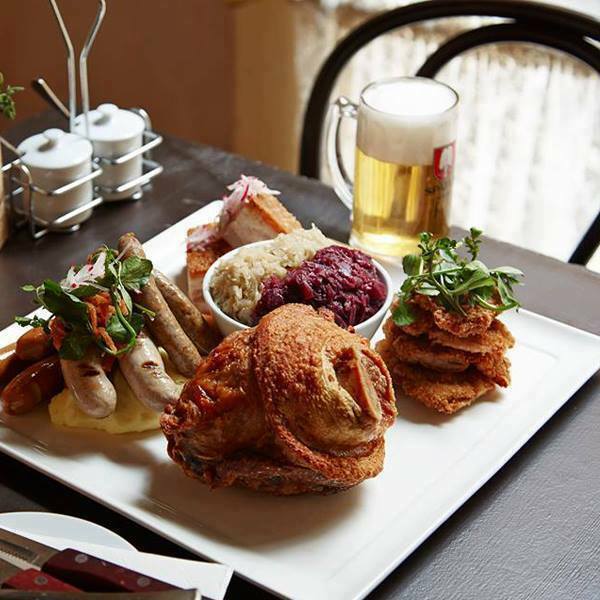 The Bavarian Bier café can be found at various locations around New South Wales including Bondi Beach, Crows Nest, Manly, Miranda, Moore Park, Parramatta, Chatswood and the ever popular York Street Sydney. Sydney's number one Oktoberfest location is more than just a relaxed eatery; there's always a party at The Bavarian. Take note of their website to keep up on events such as New Year's Eve at the Bavarian and 'all-you-can-eat hot dogs'. You can even celebrate Christmas at the Bavarian, they have sensational festive set menus. Don't forget $5 happy hour from 4pm-6pm every day. This even includes craft beer. If you order a bunch of schnapps you'll hear loud bells ringing as they bring them out on a thin wooden tray. It's quite the spectacle. The 'Butterscotch' goes down easy and everyone loves the 'Saurer Apfel' (both $9). If you are really in the mood to drink, you can order beer by the litre and there's an abundance of choice. For those not looking to get wasted, try a Bavarian Diesel. It's made with half dark larger and half cola. Talking food, the menu is truly extensive. You have to start off with the 'Haus made pretzel' ($4.75). They are warm, fresh and served with soft butter. You can't stop at just one. You also can't go past the Schnitzels, of which there are 9 different options. Otherwise, the Sausage Platter is award winning and is served with sauerkraut and mash. This is the perfect place for large gatherings, such as birthdays and Christmas parties. The staff are always friendly and dressed up in traditional outfits, which gives the place that authentic feel. They take online bookings and you can order online for pickup too. Unfortunately, this is not the best place for vegetarians or vegans, as the menu is mostly about meat.